Ylang ylang essential oil is one of the more fragrant and aromatic essential oils available. It is derived from fresh flower petals from the tropical and large ylang ylang tree (Cananga odorata). Ylang ylang translates to mean “flower of flowers,” and was named that due to its sweet, floral smell. The ylang ylang tree is native to Asian rainforests and South Pacific islands like Indonesia, Java, Philippines, Comoro, Polynesia, and Sumatra. Throughout history, and even today in Indonesia, ylang ylang is common for decorating the bed of newlyweds on their wedding night due to its aphrodisiac and energizing abilities. It has also been used for centuries for its healing properties on skin and its natural thickening effect on hair. What are the health benefits of ylang ylang oil? Ylang Ylang essential oil contains chemical compounds, including 28% benzyl acetate, 10% P-cresyl methyl ether, nine percent linalool, six percent methyl benzoate, and five percent 3-methyl-2-butenyl acetate. As a result, ylang ylang oil possesses hypotensive, sedative, antiseptic, antispasmodic, and antidepressant properties. Ylang ylang has a positive effect on the endocrine, immune, reproductive, cardiovascular, and digestive systems. Ylang ylang benefits include relieving inflammation, increasing blood flow, regulating heartbeat, fighting parasites, promoting healthy intestinal function, healing cardiac issues, and uplifting a person’s mood. 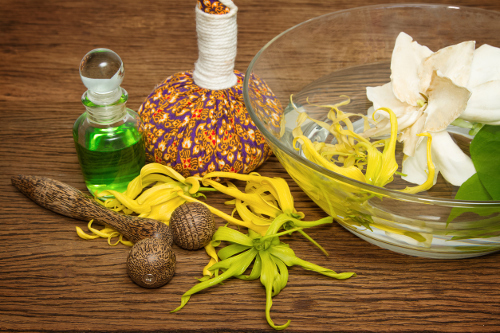 Let’s take a deeper look at how to utilize the health benefits of ylang ylang essential oil. Ylang ylang supports a healthy circulatory system by improving blood flow and fighting inflammation. It is also considered one of the most helpful oils for preventing heart arrhythmia and controlling blood pressure. You can use therapeutic-grade ylang ylang oils by adding a drop or two to warm tea or water. You can also massage a drop of ylang ylang with carrier oil over the heart. Ylang ylang essential oil also acts directly on the olfactory system of the brain when inhaled. As a result, it positively effects mood and can reduce depression. Research shows that ylang ylang can release low self-esteem, jealously, and anger. For building confidence, combine two drops of bergamot and two drops of ylang ylang. The sedative effects of ylang ylang can also reduce stress naturally and fight insomnia without the need for drugs. Ylang ylang is helpful for people who constantly feel drained or always tired. The scent of ylang ylang can be very energizing for people fighting body aches and fatigue. Apply several drops of ylang ylang to your chest, neck, and wrists for instant energy. Ylang ylang is primarily used for preserving the skin, and preventing irritation and signs of aging. Ylang ylang can even fight the development of melanoma and skin cancer cells. For optimal skincare, combine one or two drops of ylang ylang with jojoba or coconut oil, and massage it on the face at least once for daily protection. The combination of coconut oil and ylang ylang can benefit hair. You can also massage ylang ylang into the scalp to increase the appearance of hair, preventing dandruff, hair loss, and tangles. Research even shows ylang ylang and jojoba oil or coconut oil can even kill head lice. Inhaling ylang ylang or massaging several drops over digestive organs, can have a positive impact on digestive health. Ylang ylang can help increase libido in women and men, and is a natural impotence remedy. Diffusing or inhaling ylang ylang can help you feel more connected to people around you, including your spouse. Ylang ylang is also a natural diabetes remedy that can protect against cell and tissue damage, and reduce the risk of nerve damage due to diabetes complications. Massage several drops over the abdomen and pancreas, or on the reflex points of the feet. A study published in the Journal of Natural Medicines in 2014 shows that the flavonoids and terpenoids in ylang ylang essential oil can act like aldose reductase inhibitors. Other research shows that aldose reductase inhibitors can prevent nerve and eye damage in diabetics. Massage or aromatherapy with ylang ylang oil can help decrease premenstrual syndrome (PMS) symptoms. Application of ylang ylang oil with lavender oil to the lower abdomen or back of the neck, can naturally treat stress, tension, and cramps related to PMS. A study published in the Journal of Experimental Botany in 2014 found that the floral scents of ylang ylang have the potential to repel bugs and pests. The quality of ylang ylang essential oil will depend on the time of day that the ylang ylang flowers were picked. What’s interesting is that flowers picked early in the morning are thought to yield the most benefits from the ylang ylang oil because night moths pollinate the flowers. The drop in temperature that can occur overnight might also positively affect ylang ylang’s chemical structure. The 14-hour-long distillation process used for ylang ylang extract also impacts its abilities and potency. What does the research say on ylang ylang? Studies show that high-quality ylang ylang oil contains terpenoid derivatives that can treat various skin disorders. Terpenoid compounds will also inhibit cancerous melanoma skin cells. The antioxidants can therefore help protect skin cells from DNA damage and oxidative stress that can potentially lead to the formation of cancer cells. In beverages and foods, ylang ylang oil is used as a preservative and flavoring. It is also used as a fragrance in soaps, hair products, household cleansers, and cosmetics. Ylang ylang combines well with other essential oils like lavender oil, jasmine oil, bergamot oil, frankincense oil, and rose oil. Several drops of essential oils should be diluted with a few drops of carrier oils like almond, avocado, coconut, or jojoba oil. Ylang ylang oil can be used as both a stimulant and relaxant, depending on your condition. Topically – Ylang ylang should be diluted with carrier oil in a 1:1 ratio before applying it to the skin. It is a good idea to perform a skin patch test on your feet or arm to make sure you don’t experience a reaction. Also, keep the oil away from your nose, ears, and eyes. Aromatically — The essential oil can be diffused with a diffuser, or inhaled directly from the bottle. Internally — Only 100% therapeutic-grade essential oils should be taken internally, and should be mixed with water or honey. How will you use ylang ylang oil? Here are a few ylang ylang essential oil recipes. Combine all essential oils with two tablespoons of cold water, and pour it into a sterilized spray bottle. Spritz your room before going to bed. Shake before use, and avoid spraying directly onto fabric. Place the rose floral water, glycerine, and the aloe vera gel or juice in a bowl. Add the essential oils, and combine well. Transfer into a sterilized spray bottle, and store in a cool, dark place. It will keep for around six months. Combine all the ingredients in a bowl. Then transfer to a sterilized dark-glass bottle, and seal with a dropper or cap. Store the blend in a dark, cool place. It will keep for around three months. In summary, ylang ylang essential oil benefits mood, energy, skin, hair, digestion, diabetes, and much more. It is also a safe essential oil for children, or pregnant and breastfeeding women. That being said there are some things to keep in mind when using ylang ylang. For instance, high levels of ylang ylang can cause sensitivities or reactions. That is why performing a skin patch test is important before using it on your skin, face, or ingesting. Also, talk to your doctor before taking any new herbal remedy, or if you have a heart condition or take blood pressure medications. “Ylang Ylang Essential Oil,” AromaWeb; http://www.aromaweb.com/essential-oils/ylang-ylang-oil.asp, last accessed March 29, 2017. “Ylang Ylang Oil Not Only Soothes Your Skin, but Your Mind as Well,” Mercola, February 23, 2017; http://articles.mercola.com/herbal-oils/ylang-ylang-oil.aspx. “8 Surprising Benefits of Ylang-Ylang Essential Oil,” Organic Facts; https://www.organicfacts.net/health-benefits/essential-oils/health-benefits-of-ylang-ylang-essential-oil.html, last accessed March 29, 2017. Essential Oils: All-natural remedies and recipes for your mind, body, and home (New York: Penguin Random House, 2016), 53, 178, 184-185, 239. Jin, J. et al., “The floral transcriptome of ylang ylang (Canaga odorata var. fruticosa) uncovers biosyntheric pathways for volatile organic compounds and a multifunctional and novel sesquiterpene synthase,” Journal of Experimental Botany, July 2015; 66(13): 3959-3975, doi: 10.1093/jxb/erv196. Matsumoto, T. et al., “Structure of constituents isolated from the flower buds of Cananga odorata and their inhibitory effects on aldose reductase,” Journal of Natural Medicines, October 2014; 68(4): 709-716, doi: 10.1007/s11418-014-0843-y.